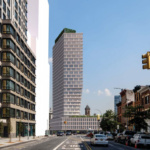 Morris Adjmi Architects and developer Jeffrey Gershon’s Hope Street Capital have presented plans for a 29-story apartment building in Clinton Hill, Brooklyn, to the Landmarks Preservation Commission (LPC) for permitting. 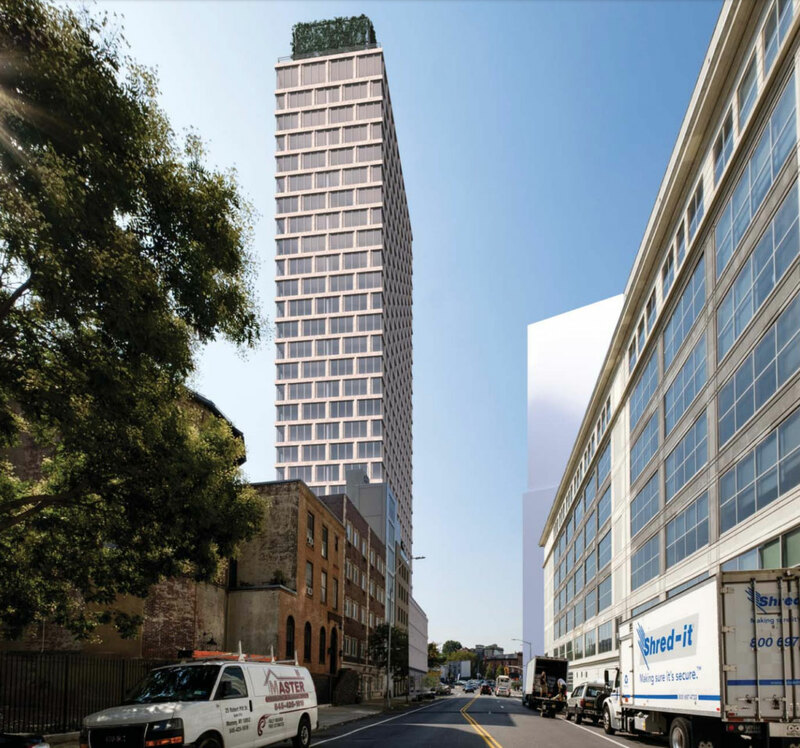 The rise of the 312-foot-tall tower at 550 Clinton Avenue is contingent on the developer’s plan to consolidate the rest of the block into a single lot, and transfer the resultant air rights to 550 Clinton. 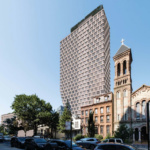 60,000 square feet of the 70,000 square feet required would come from the nearby Church of St. Luke and St. Matthew, a landmarked church in dire need of façade repairs. 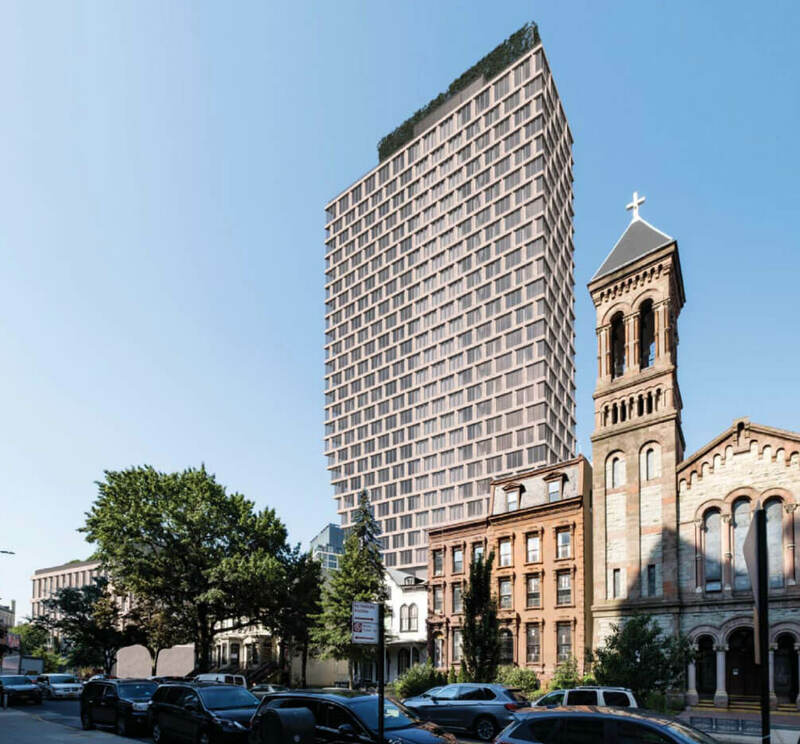 The air rights transfer hinges on LPC approval of the church’s renovation, spearheaded by Li/Saltzman Architects, and the commission kicked the project back for minor tweaks at Tuesday’s meeting. 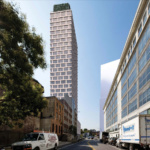 Adjmi’s tower would rise on top of a 52-foot-tall base that snakes around the lot to Atlantic Avenue and Vanderbilt. While the entire building would be clad in tan precast concrete throughout and feature windows with metal mullions, the LPC presentation indicates that the windows on the tower portion would be tripartite and span from the floor to the ceiling of the units within. Most distinctively, the tower would taper at the base and twist on the south side to meet the cantilevered upper portion. 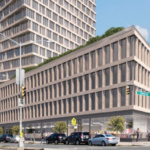 While 550 Clinton could only be built at 96,000 square feet as of right now, with the spot rezoning being requested and transfer of air rights, the final project could be as large as 238,000 square feet. 34,000 square feet would be for commercial use in the building’s base, while 202,000 square feet would be allocated for residential units. This would be allowed only through the application of Section 74-711 of the city Zoning Resolution, which allows concessions for height and bulk if a maintenance plan is set up for a landmark on the same lot. The LPC’s chagrin on the 9th resulted from questions over the materials that would be used for the façade repair of the church at 520 Clinton Avenue. Commissioner Michael Devonshire took aim at the developer’s use of composite materials to patch the front of the brownstone church instead of the original stone, noting such repairs typically last for only 25 years. Instead of voting on the residential development or restoration, the commission has asked Li/Saltzman Architects to address this issue and present at a later date. 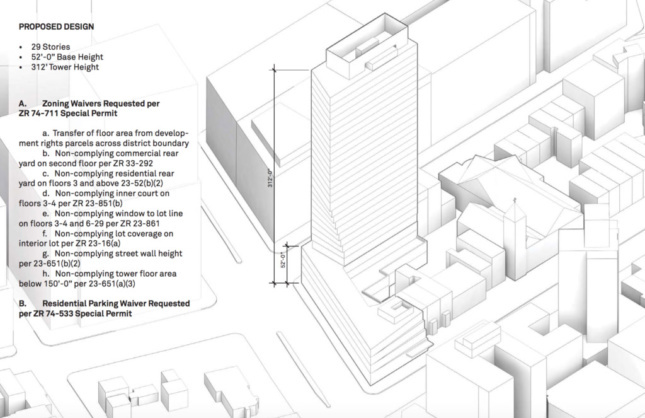 Adjmi’s design didn’t escape the meeting unscathed either, as critics called the tower project “severely stark” and inappropriate for a neighborhood where the buildings are typically brick or sandstone. 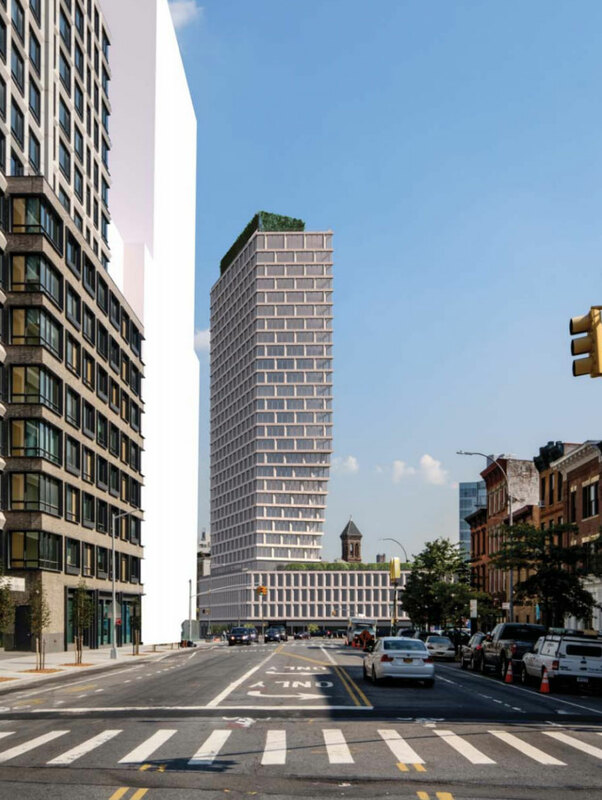 The proposal comes amidst a development boom in the Downtown Brooklyn area, and 550 Clinton is only blocks away from the Pacific Park megaproject. The full presentation given to the LPC is available here.